Trained Human: A specialist skilled in juggling, comedy, and other esoteric pursuits; a master of the unnecessary. 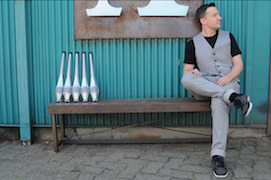 Matt Henry’s serious skills, cutting–edge effects, and innovative wit have awed and amused audiences around the world. He’s rocked the stages of Hong Kong, London, Tokyo, New York, Paris and Las Vegas–true. He’s had crowds of 10,000 chanting in unison–true. He’s a World Juggling Champion–true. He’s left–handed–irrelevant, but true. Whether your next event is in a boardroom or an arena, whether you need three minutes or more than an hour, Matt Henry Trained Human has the show for you. 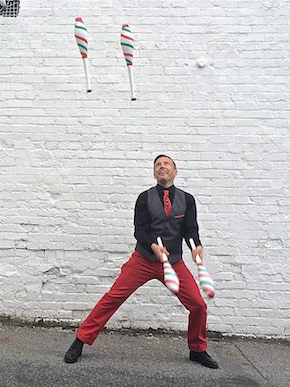 As a child growing up in Madison WI, Matt discovered the joy of juggling from the classic learn–to–juggle tome Juggling for the Complete Klutz and threw himself whole–heartedly into this odd pursuit. He cut his teeth busking on the streets of Manhattan, and later moved to Orlando Florida honing his skills with thousands (yes, thousands) of shows on the stages of Walt Disney World. He continued to expand his technical repertoire as well; his hard work was rewarded in 2001 when he bested dozens of other world–class competitors to win a World Juggling Championship. Since then, Matt’s unique brand of charm and skill has kept him in demand around the world, from corporate boardrooms to the high seas, from night clubs to symphony orchestras, from Orlando to New York to Hong Kong to London to Tokyo and back again.